The site rises gradually from Newtown Road with an elevation of about 260 feet to the hilltop, midway to the rear where the elevation is about 360 feet. From this hilltop, the site slopes downward toward the north with the northerly property line being Long Lake. Adjacent to the acquired land on the west side are 75 acres of existing conservation land. This land has been acquired through the years by gifts or tax foreclosures. It includes several thousand feet of undeveloped shoreline of Long Lake and the lake’s outflow brook. This land is now administered under this same management plan for the acquired Long Lake Conservation Land. This creates 180 acres of conservation land. Long Lake Park hosts a wide variety of natural habitats including bordering vegetated wetlands, forested wetlands, conifers, hardwoods, grasslands, and edge habitat. The southernmost portion of the parcel consists of a wet meadow which contains a stream, a vernal pool, and an upland meadow. This area extends several hundred feet north along the eastern half of the property, eventually giving way to a very thick briar patch and a red maple wetland. This wetland continues north for several hundred more feet, decreasing in width, until it ends in a narrow “finger”. Here originates the apparently spring-fed stream which flows to Newtown Road. To the east of the “finger” is a mixed hardwood forest of maple, oak, and ash, while to the west is located a several decades old white pine forest. Both forests continue north to the AT&T easement, the area north of that appearing to have been logged in the past and consisting of scattered red pine, white pine, and hardwood species, all of varying degrees of maturity. In the extreme northwest corner is a small hemlock grove and a portion of an unusual wet bottom forest actually growing in the shoreline waters of Long Lake. Flora: The diversity of habitat is again responsible for the tremendous inventory of vegetative cover. Throughout the parcel can be found typical woodland, grassland, and wetland vegetation as well as some unusual species. Some examples of the grassland vegetation: Queen Anne’s lace, mullein, bedstraw, bladder campion, evening lychnis, deptford pinks, milkweed, crown vetch, yarrow, cow parsnip, asters, onion grass, timothy and bottlebrush grass. These species offer visual beauty as well as other functions necessary for the life cycle of butterflies and other important insects. The edge habitat consists of multi flora rose, grape vines, barberry, bittersweet, blackberries, thimble berries, apple trees, dogwood, choke cherry, and other mixed shrubs that offer critical shelter and food supply for the many species of wildlife. The wetland vegetation includes royal fern, cinnamon fern, soapwort, sedge hummocks, swamp azalea, skunk cabbage, highbush and lowbush blueberry, and other wetland vegetation one would expect to find, including many types of mosses, all which have various functions and values. Some rather unusual wetland wildflowers are scattered throughout the wetlands such as cardinal flowers, pitcher plants, white turtlehead, jacob’s ladder, and the uncommon bloodroot. There are emergent plants in the lake such as pickerel weed and pond lilies. Woodland vegetation contains the typical ground covers, shrubs and flowers such as mayflower, Solomon’s seal, ginseng, pokeweed, starflower, wood anemone, Japanese honeysuckle, sheep laurel, mountain laurel, and jack-in-the-pulpit. Some uncommon wildflowers are also scattered throughout such as lady slipper and nodding trillium. The canopy layer consists of trees of varying degrees of maturity including pines, a small hemlock grove, ash, poplar, elm, maple, sumac, pear trees and black birch. Scattered here and there one can still stumble upon plants which have escaped cultivation such as a patch of asparagus or naturalized day lillies; reminders of a time gone by. Fauna: This parcel of land is located within a critical natural greenbelt and wildlife corridor running from the town of Acton to the town of Groton. Among the woodland mammals spotted throughout the years are otters, coyote, deer, fox, opossum, fishers and, raccoon. Sightings include purple martins, pileated woodpeckers, warblers, wood thrush, scarlet tanager, wild turkeys, northern oriole, oven birds, rose breasted grosbeak, bluebirds, red-winged blackbirds, bobolinks, meadowlarks, and other birds of the undisturbed forest. The great blue heron frequents the undeveloped shoreline of Long Lake in search of food for their young. There are also red-tail hawks and other birds of prey which circle the grasslands. You can find many owl pellets along the pine forest trails. There are several vernal pools located on the property, which serve the reptiles and amphibians dependent upon this habitat. There have been reports of several species of turtles along the shoreline of Long Lake. Moose tracks have also been spotted throughout the woodland. In addition to these species, the many wildflowers and other vegetation supports very diverse species of butterflies and many other important insects. The southeasterly side of town, easterly of Route 495 about midway between Routes 2 and 119. More specifically, it is on the westerly side of Newtown Road, near the intersection of Harwood Avenue. * At the end of Middlesex Drive on the road or in a dirt parking spot on the left. A well used trail starts at this location. * A parking area on Harwood Avenue near Newtown Road. A sign saying "Town of Littleton Conservation Land" is at the parking area. A new trail starts here and joins a well used older trail. * At the end of Colonial Drive. A parking area constructed by the Town is on the left before Colonial Drive turns into a narrow dirt road. Walking down the dirt road will take you to Long Lake. A renewed old trail exists on the right as you approach the lake shore. Numerous, well-established trails. Those trails that are not old roads are indicated with yellow, blue, white, or red markers on trees. Long Lake Park (LLP) has over 4 miles of trails. Trail marking is currently in the process of being updated and should be completed by Spring 2015. The Main Loop Trail (Yellow), 1.82 miles long, is located on the northeast side of LLP. It may be accessed by orange spur trails from either Harwood Avenue or Middlesex Drive trail heads. This trail features a wonderful view at the restored grassland meadow, the tranquility of Sitting Rock, the Beaver Dam, and a beautifully forested trail with glimpses of the lake along the way. The elevation along the shoreline of Long Lake is 260 feet with a gradual rise to 360 feet at the restored grassland. Please STAY ON TRAIL and KEEP DOGS ON LEASH when hiking in the Wildlife Habitat – Restored Grassland Area to help us protect NESTING BIRDS. The Charles L.Tirone Trail (Red), .65 miles long, is another loop trail on the northwest side of Long Lake Park. It may be accessed from the trail head at the end of Colonial Drive. The trail was named in memory of Charles Tirone who was the steward of this area for over 12 years. He passed away in December 2011. 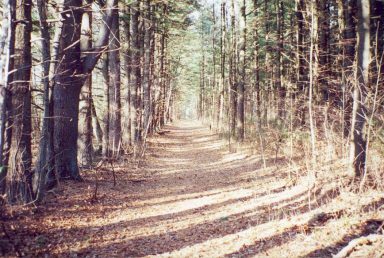 The trail is an easy walk along the wooded shoreline of Long Lake before returning to the parking lot along a portion of the AT&T Right of Way. In addition to the beautiful shoreline views there is a short side trail that features a nice Hemlock grove and vernal pool. The Vernal Pool Trail, .14 miles long, is marked with white blazes. 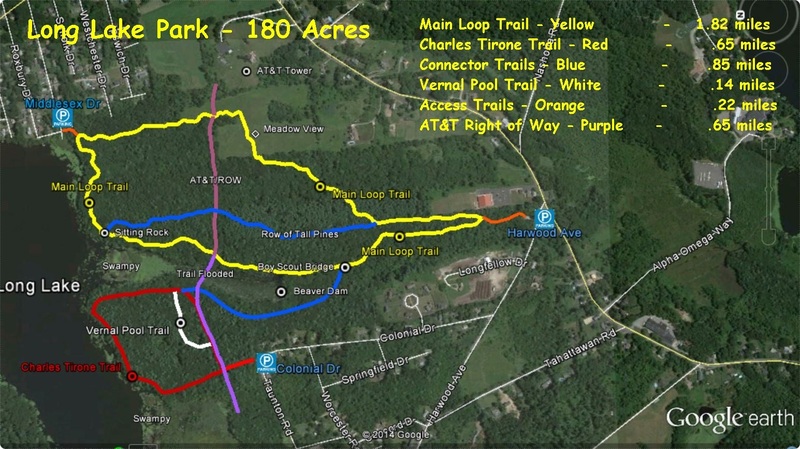 The Main Loop Trail (Yellow) and the Charles Tirone Trail (Red) are linked by a Blue connector trail, .35 miles long, which begins at the Boy Scout bridge and ends at the junction of the AT&T Right of Way. Another Blue connector trail, .50 miles long, provides direct access to Sitting Rock from the Tall Pines section of the Main Loop Trail. The AT&T Right of Way, .65 miles long, runs east to west through Long Lake Park. Beavers have created flooding along Long Pond Brook preventing complete access to this trail. Long Lake Conservation land is formerly the location of cow pastures and apple orchards, with some remaining apple trees. The land is criss-crossed with numerous stonewalls which are not, in most cases, boundary lines. Some stonewalls eventually lead into the water. Over 7 miles of 200 year old stone walls have been mapped on this property. The property was most likely used by Native Americans as a campsite through the centuries. The property abuts land that was once part of the Nashobah Praying Village, the last Christian Indian village in the area established by John Eliot. Newtown Road, which is one border of the property, was the border of the 500 acre Nashobah Indian Reserve mentioned in the original deed of the Town of Littleton. Near the shoreline of this parcel arrowheads have been found. There are stone mounds in several places on the parcel which may have significant Native American meanings.